Less than ten hours after I watched The Happening, the eerie new film from director M. Night Shyamalan-- which incidentally is one of his strongest works in years—lyrics started flooding my head. “There’s something happening here/What it is ain’t exactly clear/There’s a man with a gun over there/Telling me I’ve gotta beware,” and of course the chorus of “You’ve got stop/hey what’s that sound/everybody look what’s going down.” It took me twenty minutes of cyber-sleuthing to realize that the song’s title isn’t in the lyrics themselves—written by Stephen Stills, the popular Buffalo Springfield 60’s anthem “For What It’s Worth,” that’s been used in countless Vietnam sequences and films of and about that era from Coming Home to Forrest Gump somehow seemed like it was nearly narrating the entire feature crafted by Shyamalan. In The Happening, “there’s something happening here,” indeed and it isn’t clear at all what it is. From the start of the film—his first R rated feature-- a young woman sitting in Central Park suddenly loses her train of thought as well as her ability to think clearly and before we know it, she’s grabbed the long knitting needle styled hair pin from her up-do and stabbed it directly into her neck. From there, it just gets stranger as construction workers tumble off of buildings as if they were raindrops, cars crash into trees, buses into lakes, and a policeman shoots himself and afterward his gun is used for the same purpose by every passerby. A rash of suicide? Obviously it’s some kind of attack and the first line of thinking falls under the one we’d immediately leap to which is that it’s the result of terrorists once again catching New Yorkers off guard but when there’s no real evidence of this and we get the sense that it’s airborne, people begin wondering just how exactly they can outrun something they don’t quite understand. A slow march towards gloom ensues—there aren’t scenes of irrational screaming and panic for there are no bogeymen lurking around corners, alien ships crashing down, or whatever that creature from Cloverfield was. Nor is there a direct nuclear military testing site nearby that may have explained what created those larger than life monsters in Stephen King’s The Mist or the medical experimentation gone awry in I Am Legend. Shyamalan is ultimately new age here, arguing in his most quintessentially vague way that perhaps we are all to blame--that it’s in the wind-- and that we’re all culpable since it may be emanating from trees and plants. While a horror film about global warming may sound cheesy on paper and one can do no better than Al Gore’s fact based An Inconvenient Truth, it makes a great set-up for Shyamalan’s newest universe that finds New York residents being evacuated and Pennsylvanians like Moore, his wife Alma (a wasted and poorly written Zooey Deschanel), Elliott’s colleague Julian (John Leguizamo) and his young daughter Jess (Ashlyn Sanchez) deciding to flee urban areas for sparsely populated communities. As the “event” spreads from New York into Massachusetts, New Jersey and Pennsylvania, they try to outrun it, putting together theories of survival by addressing the variables—possibly deciding to travel in fewer numbers to more desolate locations but will that be enough? In a heart-wrenching scene, after Julian loses cell phone contact with his wife, he entrusts his daughter to his friends and although he tells them he’ll be coming right back with Jess’ mommy, we just know that he won’t return. A sense of doom pervades but unlike other films of Shyamalan’s, he prefers not to offer anything concrete in the way of answers almost to maddening effect. There’s a perfunctory possible theory put forth near the end of the film but then-- true to his directorial nature-- he has to spook his audience one last time, reminding us of the inevitably abysmal fate of mankind. Since the film seems like such a pessimistic parable, Shyamalan noted on the DVD that he wanted to fill it with as much light as possible in casting likable and buoyant leads such as Mark Wahlberg in a role he wrote expressly for the actor. Ironically however, Wahlberg revealed he ended up modeling his characterization after Night himself. And Wahlberg anchors the entire film, elevating it throughout as we encounter one freakishly eccentric and mean-spirited backwoods character after another as they discover gunfire and the wrath of a wicked older woman straight out of the oeuvre of Stephen King, yet Deschanel looks as though she’d rather be anywhere but in the film, which is no surprise as she’s given absolutely nothing to do and her entire arc is in revealing to her husband that—and I kid you not-- she once ate dessert with another man. Despite its flaws, it isn’t as atrocious as some critics would lead you to believe and it’s a masterwork compared to the disastrous Lady in the Water that seriously made us question Night’s filmmaking ability overall. Still, nowhere near as perfectly fine-tuned as The Sixth Sense—the tragedy is that he’s been unable to top himself, no matter how hard he tries and while he’s undoubtedly an incredible talent, it may do him good to get out of his usual screenwriting trappings to try something entirely different altogether, instead of feeling a near obligation to “surprise” us in the end over and over and over again. 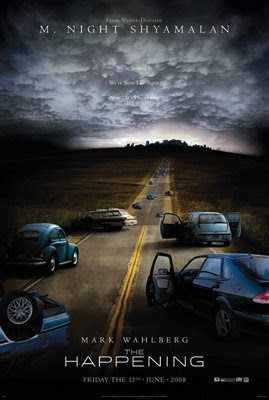 While The Happening redeems itself, it would be great to have Night move away from some of these recurring tendencies and themes, since with a much better written female lead (always a struggle for Night, save for Toni Collete in Sixth Sense) and a tighter finale, it may have been his strongest work since the one that’s become synonymous with his name. However, this being said, I do applaud his Hitchcockian restraint in building up fear instead of simply reveling in the gore of the situation by cutting away from the most shockingly violent moments—a decision you can witness just based on the first ten minutes alone. And as all film professors will tell you, it’s nearly worse to “not see” something and the master of withholding details (whether it’s the true meaning of “I See Dead People” etc.) proves that he knows what to hold and show when it comes to R rated horror. As he himself shares on the fully loaded DVD, which contains numerous featurettes, fear is always based on the unknown when one loses their bearings and panics and on film, Night strives to take that same feeling and multiply it by ten. In other words, in this new DVD, “there’s something happening here/what it is ain’t exactly clear,” but you can bet it keeps you riveted all the same… and you’ll never look at trees the same way again... or come to think of it, bees.